Here is a list of projects from last years science showcase. Review the content, and the different layouts of the different multi-media presentations. What to do if you want to over the break. You might even just start thinking about the information to research. Below is a list of what to cover to make your assignment successful. Good luck. What environmental factors influence the growth rate of plants? Need to do some background research or this one as well as your results that could support your researched evidence. Below is another video of what the eclipse looked like from space. These images were taken by a satellite. Also see how big the universe is by using this website to view what is out there and beyond. Check out the link below to see what celestial events are happening this week. The Moon is farthest away from the Earth making it the smallest full moon of the year. Can you see the difference? Watch these 2 youtube videos to help you remember the phases of the moon. Good luck. Vocabulary for this unit is on the link below. Please read and study 5 new words every night. Make sure that you scroll down to the bottom of the page to see the definitions or click on the 2 PDF files to view. What predictable, observable patterns occur as a result of the interaction of the Earth, sun, moon, and stars? Students know how to use a compass and track the position of the Sun in the sky. They will also learn how the suns changes during the course of the day and from season to season. Students know that Earth is one of several planets that orbit the Sun and that the Moon orbits Earth. 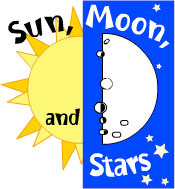 Students know the way in which the Moon's appearance changes during the four-week lunar cycle. Students know the patterns of stars stay the same, although they appear to move across the sky nightly, and different stars can be seen in different seasons. Click on the links below to view each groups Mixtures and Solutions Assignments. Some students used a website or a prezi to showcase their investigations. This is the students first try and they have done a good job. The next step for us will be critiquing the work and looking for areas to improve upon. The 2nd investigation will be filmed and presented at the Science Showcase later on in the year in a digital format. Happy viewing.